It is a strange feeling reviewing the first motherboard on a new chipset with a new CPU and new memory on a new test bench. While we, like you, eagerly await shiny new hardware, we do so with trepidation because more often than not, time scales are changed and limit the amount of time available for testing making a review all the more difficult. Add to this the fact we often receive products under NDA that are unfinished or at best rushed out of the factory in-time to get to the media for release so require BIOS update after BIOS update making us feel like lab rats. This wasn't the case with the MSI X99S Gaming AC. While it is true we received the board the day before release, we have not had to update the BIOS, seek additional advice from the manufacturer or encountered any configuration problems whatsoever. It worked straight from the word go. This is rare for a motherboard test. Moreover it not only worked but did so in extra ordinary fashion. We normally find some bugs, glitches that we can forgive due to short time scales involved on a pre-release product but the MSI felt so...complete is the only work for it. Akin to a motherboard that had been rigorously tested or had undergone a few revisions, not a brand new fresh of the production line model. We really do appreciate this, as will you. No doubt there will be BIOS updates to enhance your experience but for now, in its current state, we can safely say you shouldn't encounter too many problems. Yes there are a few minor niggles such as the I/O cover but for the most part it is very hard to criticise this motherboard. It is a stunner to look at, overclocks extremely well (yet surprisingly easy) and arrives with everything you should need and then some. The on-board features are what we would expect from a larger motherboard platform (EATX) but somehow MSI have managed to cram it all into a standard ATX size. Add to this some very neat detailing touches like 'gaming' worked into the copper traces and the MSI X99S Gaming 9 AC has set the bar very high. 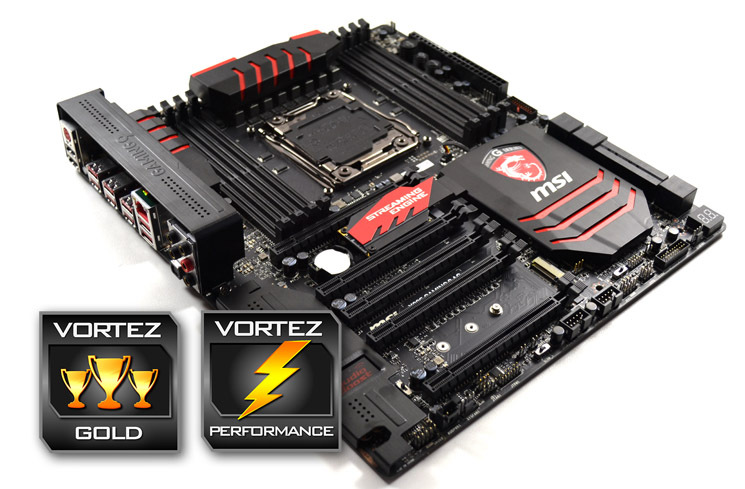 For this reason we are happy to grant this motherboard our prestigious Gold and Performance awards. Whether you are an extreme overclocker or avid gamer, the MSI X99S Gaming 9 AC has it all. Buy it - you will not be disappointed.